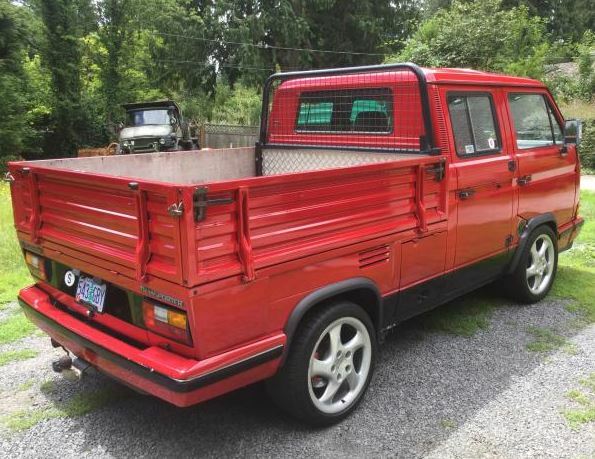 This Subaru-swapped Volkswagen is the best hybrid-pickup since the BRAT. Volkswagen produced one of the most iconic, hippy-friendly vans that, unbeknownst to them at the time, would live on in popular culture. The Vanagon was derived from the Beetle in 1950 as the T1. Since it was first introduced, the chassis has gone through six generations, some of which were sold under different names. A particularly interesting unit that caught our interest is this fourth-generation Vanagon, known as the Eurovan. 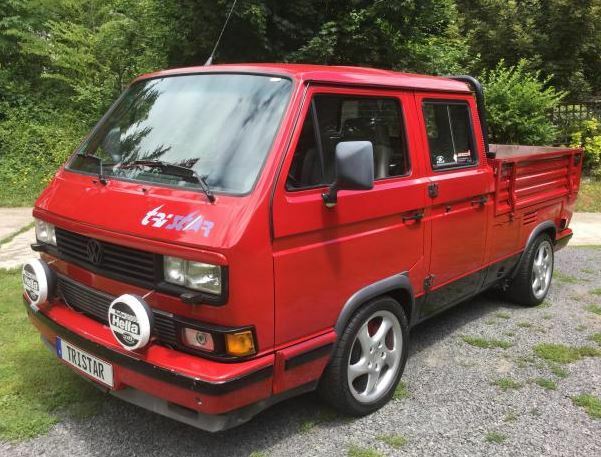 This 1990 Volkswagen Vanagon Tristar Doka might be a mouthful, but it’s even more complicated to drive because of what’s going on under the hood. 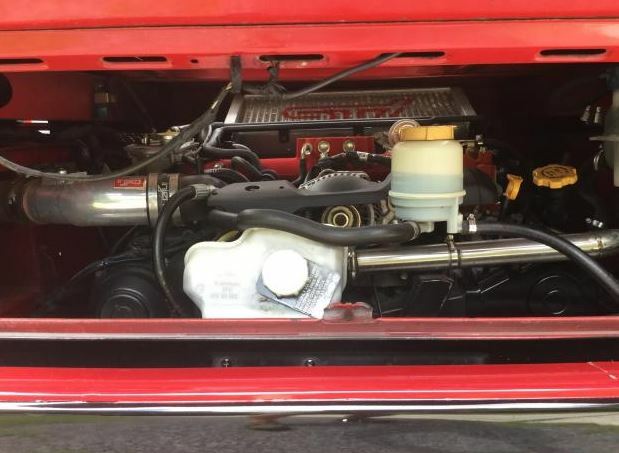 Though a 2.5-liter gas engine was an option in this Vanagon, a different, 2.5-liter somehow made its way into the van-turned-pickup. Some lunatic swapped an EJ257 motor from a Subaru Impreza STI making 375 horsepower into the Vanagonand, and put it up for sale on The Samba back in 2016 for $35,000 (it has since sold—sorry). 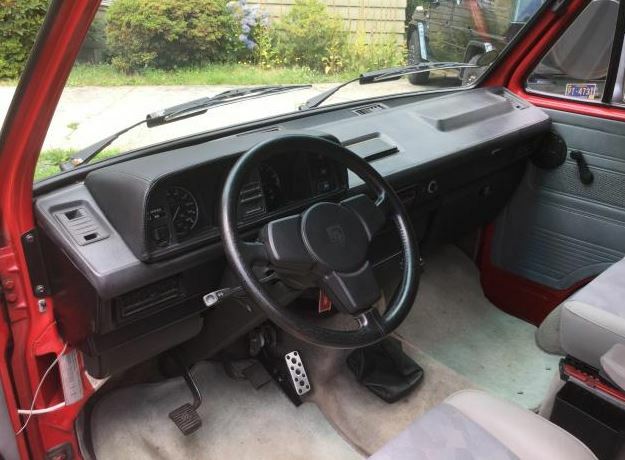 On the inside is a Subaru gas pedal (surely a nod to the boxer-heart of the car) and a vintage Porsche steering wheel. Exterior modifications are simple and elegant. The original “tristar” graphics still sit on the cowl above a pair of Hella spotlights. The car sits tastefully lower than stock on H&R cup springs. It sits on a set of Porsche factory Twist wheels over a set of four-piston brakes from the Porsche 993 Turbo. This seems appropriate, given that the drivetrain is a Porsche five-speed transaxle. Lastly, the bread and butter of this unique build is the motor pulled from a 2004 Subaru STI, complete with factory top-mount intercooler (which does not seem to get much airflow under the hood). Also, this YouTube channel is full of cool little short videos of the swapped monster. Given the choice between this and the Subaru BRAT, which would be the more fun swap platform? These are the makings of Subaru's crazy stunt. You have to be smart when passing on a two-lane road. Apparently someone forgot to tell that to this motorist. Driver Mark Higgins appeared to enjoy the jarring dash down the track.